(CNN) -- The U.S. military did major damage to the site of one of the wonders of the ancient world while converting it into a base, the United Nations said in a new report. 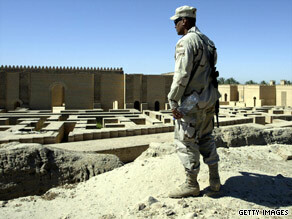 An U.S. soldier looks over the ancient city of Babylon in Iraq in 2004. The site of the Hanging Gardens of Babylon was converted into Camp Alpha shortly after the United States invaded Iraq in 2003. The troops and their contractors caused "major damage" by digging, cutting, scraping and leveling while they were revamping the site to meet military standards, the U.N. cultural agency, UNESCO, said in a report. "Key structures that were damaged include the Ishtar Gate and the Processional Way," the report added. The Ishtar Gate, an entrance to the northern part of the city, is decorated with animals that portray the symbol of the god of the city of Babylon. "Damage to the gate includes smashed bricks on nine of the bodies of the animals adorning the gate," according to the report. A military official said she had not seen the U.N. report, but added that one of the reasons troops set up a base at the site was to safeguard it. "Coalition forces first occupied the Babylon site in April 2003 during the ground campaign of Operation Iraqi Freedom with a purpose, among others, of protecting the ruins from looting after the provincial museums in Babylon and Kufa were robbed of their entire contents," said Lt. Col. Tamara Parker, a spokeswoman. "U.S. forces respect historical sites in Iraq," she added. The United Nations lists additional damage to the site, including trenches used as firing positions and barbed wire secured to various spots. The stakes used to set up the barbed wire damaged walls, according to the report. Babylon, an hour's drive south of Baghdad, dates to ancient Mesopotamia. The city on the banks of the Euphrates River was the home of Hammurabi and later Nebuchadnezzar, who built the famous gardens for his wife. Alexander the Great wished to make Babylon his capital, but died before realizing his plan. During colonial times, archaeologists hauled off Babylon's artifacts to Europe. Some of those artifacts can be seen in a museum in Berlin, Germany. The site was occupied by Camp Alpha from September 2003 till December 2004, the report said. The United States has agreed to pay $800,000 to help rehabilitate the Babylon site, an Iraqi official said. "We were very disappointed when multinational forces took over these ancient sites as bases although they knew how important these sites are to Iraqis and to the entire world," said Abdulzahra al-Talaqani, spokesman for the ministry of tourism. Plans are under way to clean up the area in August with the help of hundreds of volunteers, according to al-Talaqani. The U.N. report noted that U.S. troops were not solely responsible for ruining the 4,000-year-old city. Before their arrival, local residents had contributed to the damage, mostly through development, the report said. "The features of the western side of the city of Babylon disappeared many years ago due to encroachment by agriculture and development on the archaeological zone," the report said.